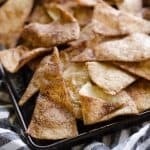 Baked Cinnamon Sugar Tortilla Chips are easy 4 ingredient homemade chips baked in the oven with butter, cinnamon and sugar. 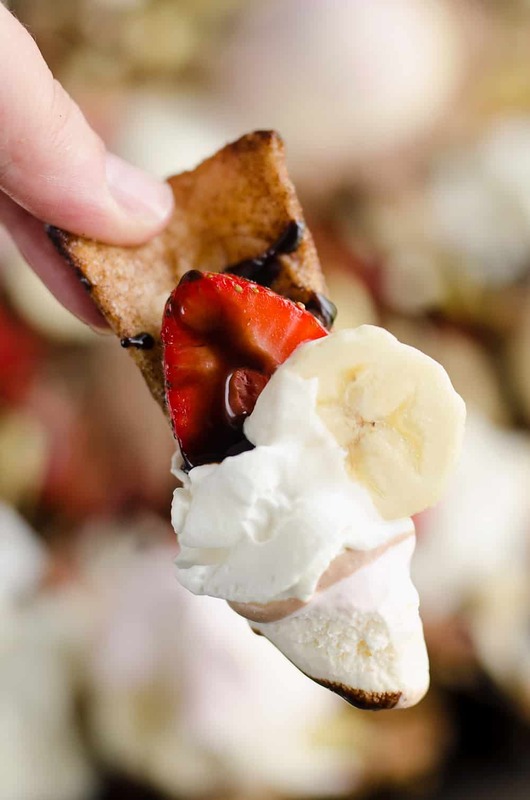 This sweet treat is perfect for dessert nachos, dipping in fruit salsa or snacking on alone! 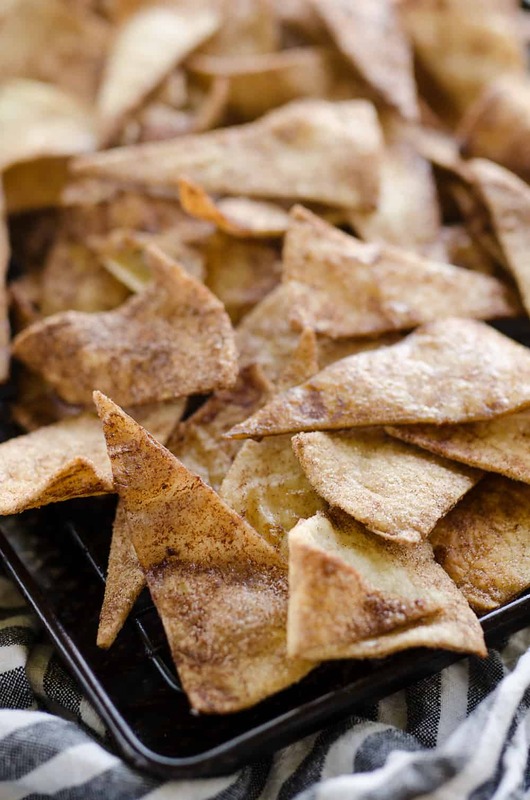 These Baked Cinnamon Sugar Tortilla Chips are a buttery, flaky, sweet treat perfection! 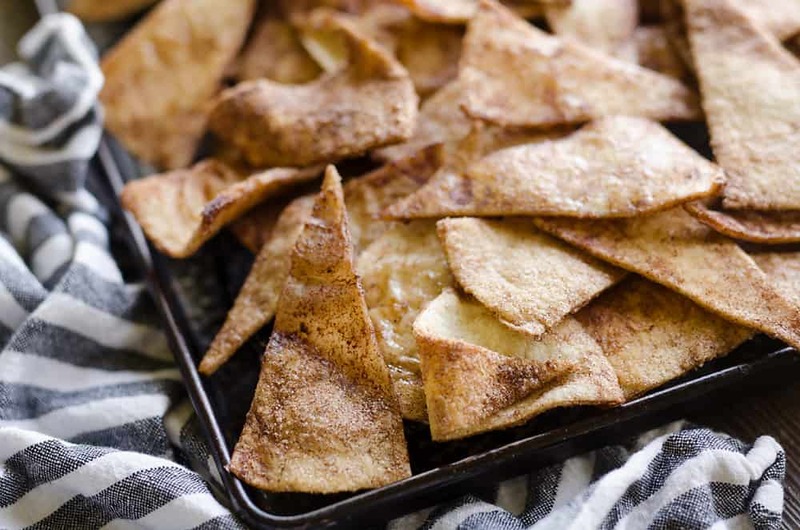 Whether you are whipping up a batch of dessert nachos, looking for something to scoop up a fresh fruit salsa with, or enjoy snacking on them alone, they are a wonderfully delicious dessert made from scratch in your oven. They make a big batch, perfect for sharing or bringing to a party! 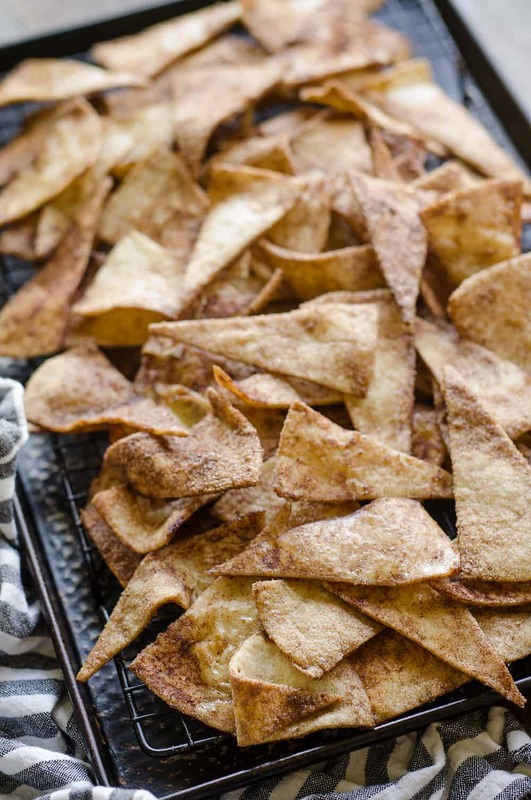 The beauty of these Baked Cinnamon Sugar Tortilla Chips are that they are made in the oven with easy cleanup. There is no need to whip out the messy deep fryer or heat up splattering oil on the stove top. Simply add the cut tortillas to the melted butter in a large bow. Put the lid on the bowl and shake vigorously until they are well coated. Add the cinnamon and sugar mixture and do the same thing. After you make sure they are all well coated, arrange the tortillas on a cooling rack over a lined cookie sheet. 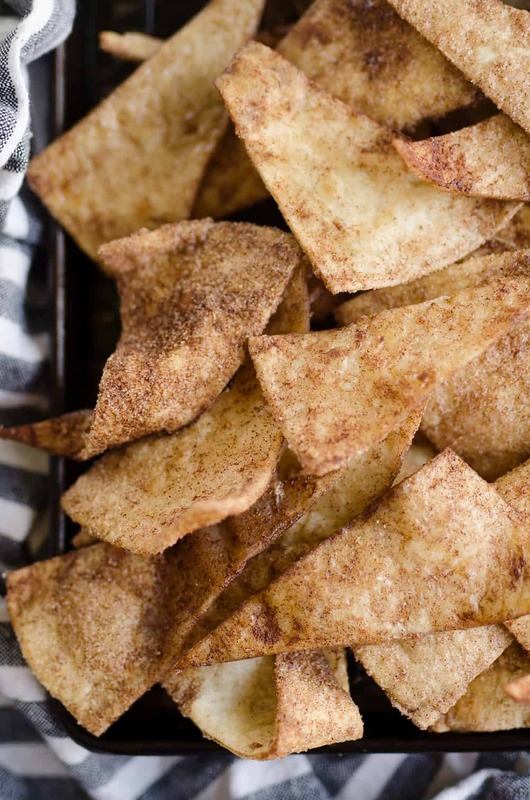 Bake them off in the oven and you have homemade dessert chips ready in no time! Line 2 cookie sheets with parchment or tin foil and top with cooling racks. In a large bowl that has a lid, microwave the butter for 1-2 minutes, or until completely melted. Cut the stack of tortillas into 12 wedges each. Add the tortilla wedges to the bowl of melted butter. Place the lid firmly on the bowl and shake vigorously until the tortillas are evenly coated. In a small bowl combine the cinnamon and sugar. Toss the mixture over the buttered tortillas. Place the lid back on the bowl and shake well. Separate any tortillas stuck together and re-shake to ensure they are all coated well. Arrange the tortillas over the cooling racks and bake at 400° for 8-12 minutes until lightly golden. Some of the chips may still appear soft, but upon cooling they will crisp up. Allow to cool to room temperature and store in an airtight container for up to 2 days. These are one of my favorite snacks!!! I LOVE dessert nachos!!!! I really need to make these, they look SO GOOD!!! Love this idea for fruit salsa! I have to say these sound incredible. I mean, anything with cinnamon already has my attention, but these seem quite special! Aw, these look so cute and good! 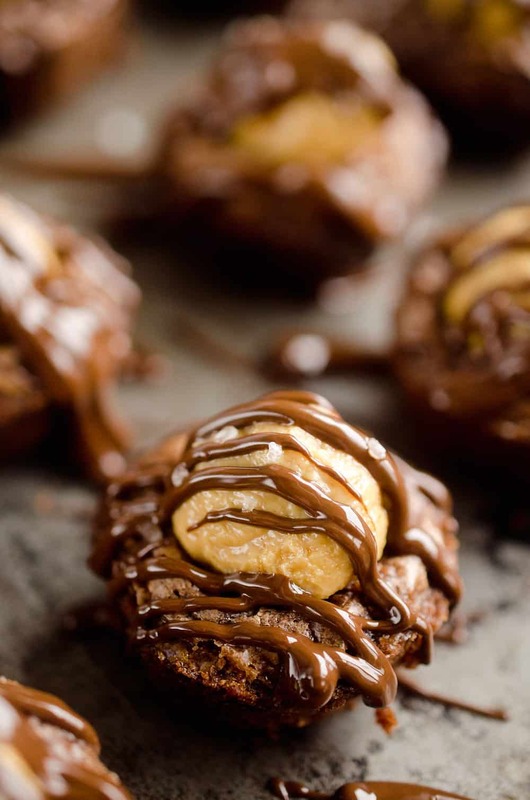 These look seriously delicious- I think I’d love them even more with fruit salsa or dipped in Nutella! These look SO GOOD, especially dipped in whipped cream and fruit! This looks so good! Perfect for a summer snack!! 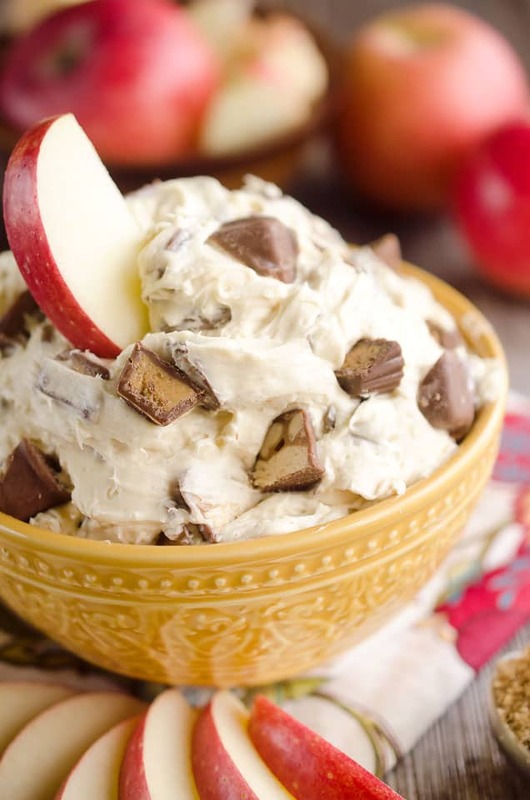 This looks amazing, Love such simple and easy snacks anytime! I definitely think more sugar is needed or less cinnamon. After costing the tortillas they were almost black from the cinnamon. I thought it would be ok after baking but that was definitely not the case at all. Also maybe cut back on the cooking time. 15 minutes was way too long and the tortillas were overcooked. I would give this recipe 3 stars. I followed this recipe exactly. Use a different recipe, y’all. 2 stars. Recommend doing less cinnamon and DONT PUT IT IN 15 MINUTES. BAKES FOR WAY TOO LONG! 400 degrees for 15 mins? After only 8 minutes they were burned black and everything had to be tossed in the trash. Thank you for wasting my groceries with your untested instructions. These do not burn before 15 minutes. They come out perfect every time I make them. All you people who burnt things really need to learn to bake. Times and tempts vary depending on oven. These were beyond yummy and I even pleased an uber pick 12 year old with them.